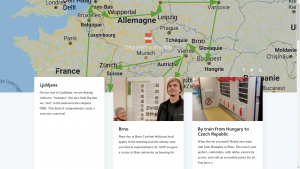 Can Decreix is a place to demonstrate and reflect around the topic of degrowth. 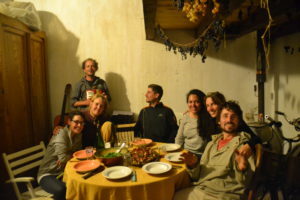 Started by activist scientists from Research & Degrowth, Can Decreix (“degrow” house in catalan) is a centre for transformation (of fruits, vegetables, constructions, societies), for research, arts and agroecology, integrating different frugal technologies with frugal lifestyles (enjoying simplicity with e.g. crazy folk dance and massage parties;). Situated in Cerbère, a shrinking tiny town, on the sea-side border between France and Spain, Can Decreix is a degrowth house and a space to accept limits and question borders and not pretending to conquer virgin territories. Can Decreix is connected with its surroundings. It was created with the idea to put in practice various degrowth strategies: simplicity in living and producing, reflection and research, organization of meetings and artistic events. This involves a range of activities from the organisation of conferences and workshops, to working on practical ecological methods and organizing of hiking through the local ridges, or bicycle tours. The project strives to have minimum impact on nature, with minimum energy consumption, with water recycling, solar kitchen and washing-machines without electricity. The terrain has typical terraces of vineyards and olive trees. Wild plants are often on the menu. Can Decreix is also a quiet place for thinking and writing. 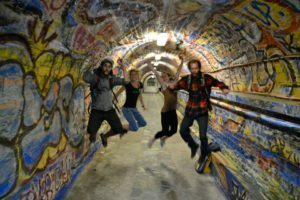 The system of groovy tunnels, the enormous train station larger than the village and mostly used for the transit of cars and chemicals, the memories of the once flourishing industry of train-based trade, serves as additional inspiration to think of employment and transport in a degrowth context. We are engaged in the local association to support the local trains from Perpignan to Portbou & in support of the night trains that have been dramatically reduced and that we intend saving in extremis. Generally Can Decreix is about « low-tech » innovation as opposed to « high-tech ». However far from focussing on one specific technique, we develop a coherent degrowth/low-tech system, where different technics are linked to one another. Can Decreix organises special design workshops. Can decreix is about experimenting. However this is not about isolated experimentation, it is about compiling knowledge between us, building knowledge based on previous experience and about documenting it. The project is also about sharing living space for certain period of time (with volunteers being more than welcome). Can decreix is developing a convivial management of different material cascades. The plants cascade : Wild plants;our emblematic plants are Capucina, Lavatera, Sonchus, Wild Cabbage and above all certainly Cactus Opuntia which lead to innovative cooking reciepes. Frugal cultivations like vines, or olive trees are used in many products. We also get food from other projects nearby, or bulk from organic distributors. Organic wastes are composted and used as fertilizer. The water cascade : Trees that do not require irrigation like olive trees, vines and cactus are favoured. The grey water from the shower and dishwashing is used to water trees, where the ecological plants or potassium soap function as a fertilizer. Rain water is used for our water-frugal agriculture, with so-called wicking beds, underground irrigation, and tree plantation. 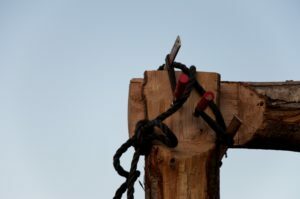 The wood cascade: Wood that would otherwise be burned in open-air is used for building or making wooden objects. « Not usable » agricultural wood or waste wood (without chemicals) is used for efficient cooking and heating (with so called « inverse fires »). Ashes are recycled to make ash water, used for cleaning & irrigation. Ashes remains are used to reduce soil acidity. Some leaves and small branches are composted or used as mulch. The metal cascade: Metals are recuperated and used to build pedal machines. Used metals are sent to recycling. The energy cascade: we use as little energy as possible, as we have neither an electric fridge, nor any electric washing devices, nor electric cooking. Our little electricity comes from an energy cooperative (http://www.enercoop.fr/). We get energy from sun (solar oven and heaters) and waste wood that we use for cooking before it heats up our bodies and living spaces. In the future we will get it from photovoltaic panels and wind energy. The transportation cascade: we promote trains, linked to buses, bicycles, auto-stop, foot. The human cascade : Knowledge and physical strength like emotions and delicateness are given value in Can decreix, tensions are used to improve organisation. Experience is valued as theoretical and rational thinking, but also emotional and spontaneous sources are given lots of credit, movements are useful for building as well as for dancing, physical beauty is enhanced with movements and cactus cream. This makes us pedal to wash clothes, transport goods, or sew but also dance at the sound of accordion. What happened in Can Decreix ? In July 2012 and September 2017 the Ecotopia Biketour visited Can Decreix, more information about the Biketour can be found on its website Ecotopiabiketour. International projects with Beyond our Backyards (BoB), GROWL in October 2012 and . For a week Can Decreix was populated by over 50 agroecologists, discussing, networking and contributing to the place. 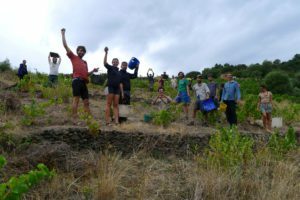 Can Decreix further attracts volunteers who are curious about degrowth theory and practical lifestyles and who take part in the construction and transformation work. We organize regular Can Decreix tours, collective work and workshops, together with a shared convivial meal. Many workshops took place like the one about Permaculture in link with “Permaculture et Transition en Pays catalan” (http://ptepc.blogspot.fr/) or events in the village like seminars on degrowth, edible botanic tours, presentations of Can decreix. We had many group-assembly processes to build collective proposals with large groups. Even in the degrowth movement there is this idea that partying requires wasting (expressed with this idea of dépense that had been theorised and practised with TAZ & Burning Man). In Can Decreix we challenge the idea that simplicity is boring and that only wasting is fun. This is for example what we experience with Chabrot (cleaning your plate with wine), a way to completely avoid the use of detergents the necessity of treatments and pipes unplugging, and having great fun. This is also what we experience with singing, playing music and dancing with live music. Massages with natural cosmetics are also fun.